This specification details a model for representing potential and completed activities using the JSON format. It is intended to be used with vocabularies that detail the structure of activities, and define specific types of activities. This draft is heavily influenced by the JSON Activity Streams 1.0 specification originally co-authored by Martin Atkins, Will Norris, Chris Messina, Monica Wilkinson, Rob Dolin and James Snell. The author is very thankful for their significant contributions and gladly stands on their shoulders. Some portions of the original text of Activity Streams 1.0 are used in this document. In the most basic sense, an "Activity" is a semantic description of an action. It is the goal of this specification to provide a JSON-based syntax that is sufficient to express metadata about activities in a rich, human-friendly but machine-processable and extensible manner. This can include constructing natural-language descriptions or visual representations about the activity, associating actionable information with various types of objects, communicating or recording activity logs, or delegation of potential actions to other applications. Activity Streams 2.0 is suitable as a social data syntax. It forms part of the [[SWP]] suite of related standards. The JSON Activity Streams 1.0 [[AS1]] specification was published in May of 2011 and provided a baseline extensible syntax for the expression of completed activities. This specification builds upon that initial foundation by incorporating lessons learned through extensive implementation, community feedback and related ongoing work from a variety of other communities. Unification of "verb" and "objectType" to "type"
This specification describes a JSON-based [[!RFC7159]] serialization syntax for the Activity Vocabulary that conforms to a subset of [[!JSON-LD]] syntax constraints but does not require JSON-LD processing. While other serialization forms are possible, such alternatives are not discussed by this document. When serialized, absent properties are represented by either (a) setting the property value to null, or (b) by omitting the property declaration altogether at the option of the publisher. These representations are semantically equivalent. If a property has an array value, the absence of any items in that array MUST be represented by omitting the property entirely or by setting the value to null. The appropriate interpretation of an omitted or explicitly null value is that no value has been assigned as opposed to the view that the given value is empty or nil. An Activity Streams Document is a JSON document whose root value is an Activity Streams Object of any type, including a Collection, and whose MIME media type is "application/activity+json". Activity Streams 2.0 documents MUST be serialized using the UTF-8 character encoding. The serialized JSON form of an Activity Streams 2.0 document MUST be consistent with what would be produced by the standard JSON-LD 1.0 Processing Algorithms and API [[!JSON-LD-API]] Compaction Algorithm using, at least, the normative JSON-LD @context definition provided here. Implementations MAY augment the provided @context with additional @context definitions but MUST NOT override or change the normative context. Implementations MAY also use additional properties and values not defined in the JSON-LD @context with the understanding that any such properties will likely be unsupported and ignored by consuming implementations that use the standard JSON-LD algorithms. See the Extensibility section for more information on handling extensions within Activity Streams 2.0 documents. JSON-LD uses the special @context property to define the processing context. The value of the @context property is defined by the [[JSON-LD]] specification. Implementations producing Activity Streams 2.0 documents SHOULD include a @context property with a value that includes a reference to the normative Activity Streams 2.0 JSON-LD @context definition using the URL "https://www.w3.org/ns/activitystreams". Implementations MAY use the alternative URL "http://www.w3.org/ns/activitystreams" instead. This can be done using a string, object, or array. Document providing a context as a string. "content": "My dog has fleas." Document providing context as an object using the @vocab keyword and a prefix for extension terms. Document providing context as an array, and including an alias for an additional term. When a JSON-LD enabled Activity Streams 2.0 implementation encounters a JSON document identified using the "application/activity+json" MIME media type, and that document does not contain a @context property whose value includes a reference to the normative Activity Streams 2.0 JSON-LD @context definition, the implementation MUST assume that the normative @context definition still applies. This specification uses IRIs [[!RFC3987]]. Every URI [[!RFC3986]] is also an IRI, so a URI may be used wherever an IRI is named. There are two special considerations: (1) when an IRI that is not also a URI is given for dereferencing, it MUST be mapped to a URI using the steps in Section 3.1 of [[!RFC3987]] and (2) when an IRI is serving as an "id" value, it MUST NOT be so mapped. Relative IRI (and URL) references SHOULD NOT be used within an Activity Streams 2.0 document due to the fact that many JSON parser implementations are not capable of reliably preserving the base context necessary to properly resolve relative references. All properties with date and time values MUST conform to the "date-time" production in [[!RFC3339]] with the one exception that seconds MAY be omitted. An uppercase "T" character MUST be used to separate date and time, and an uppercase "Z" character MUST be used in the absence of a numeric time zone offset. This is specified using the following [[ABNF]] syntax description. The "time-hour", "time-minute", "time-second", "time-secfrac", "time-offset" and "full-date" constructs are as defined in [[RFC3339]]. It is important to note that the `time-offset` component does not correlate to time-zones, and while times that include the `time-offset` component work well for timestamps, they cannot be reliably converted to and from local "wall times" without additional information and processing. Following are three examples of activities with varying degrees of detail. Each example is shown using the normative JSON serialization defined by this specification. Expresses the statement 'http://www.test.example/martin' created 'http://example.org/foo.jpg'. No additional detail is given. Expresses the statement "Martin Smith added an article to the blog 'Martin's Blog' at 3:04 PM UTC on February 10, 2015." Some additional details about the article, actor and target blog are given using properties defined by the Activity Streams 2.0 Vocabulary. "name": "Why I love Activity Streams"
A more extensive, single-entry "Activity Stream" follows. "ga": "Martin phost le fisean nua a albam." The Activity Vocabulary normatively defines the core object types and properties for Activity Streams 2.0. Every JSON object in an Activity Streams 2.0 document is either an Object or a Link. All other types defined in the Activity Vocabulary, as well as all extension types, are derived from these two base types. A JSON object in the Activity Streams 2.0 document is a Link if either: (a) the object contains a type property whose value includes "Link" or (b) any of the types included in the value of the type property are defined as extensions of Link (see Mention for instance); otherwise the JSON object is considered an instance or extension of Object. The Object is the primary base type for the Activity Streams vocabulary. All properties are optional (including the id and type). The Activity Vocabulary defines a range of Object types that are common to many social Web applications. This specification stops short of defining semantically specific properties for most of these objects. External vocabularies can be used to express additional detail not covered by the Activity Vocabulary. Furthermore, while implementations are free to introduce new types of Objects beyond those defined by the Activity Vocabulary, interoperability issues can arise when applications rely too much on extension types that are not recognized by other implementations. 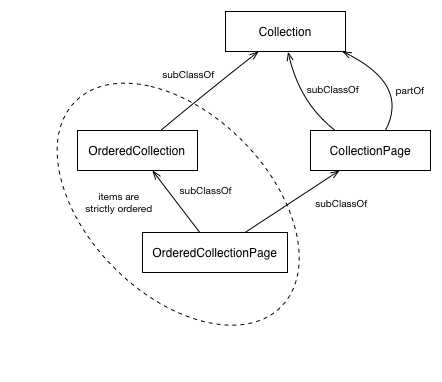 Care should be taken to not unduly overlap with or duplicate the existing Object types. Certain properties defined by some External Vocabularies can overlap or duplicate those defined by the Activity Vocabulary. Where such overlap exists, for the sake of consistent interoperability, implementations MUST favor the use of properties defined by the Activity Vocabulary. Activity Streams consumers often need a text representation of an Activity Streams object, e.g. for display in a Web browser or console interface. The name property SHOULD be derived from input by the creator or another user. The summary property SHOULD be used as a fallback text representation, possibly automatically generated by the publisher. If there is no name property, the summary property SHOULD NOT include markup, and SHOULD be short enough to be used as a reasonable text representation of the object. "content": "I feel that the weather is appropriate to our season and location." "content": "Everything is OK here." The name and summary MAY be absent, MAY lack explicit values in the end user&apos;s current language, and MAY be longer than appropriate for use as a text representation of the Object in the current language context. Consumer implementations SHOULD have fallback strategies for text representation of Objects in these cases. A Link describes a qualified, indirect reference to another resource that is closely related to the conceptual model of Links as established in [[!RFC5988]]. The properties of the Link object are not the properties of the referenced resource, but are provided as hints for rendering agents to understand how to make use of the resource. For example, height and width might represent the desired rendered size of a referenced image, rather than the actual pixel dimensions of the referenced image. For example, all Objects can contain an image property whose value describes a graphical representation of the containing object. This property will typically be used to provide the URL to an image (e.g. JPEG, GIF or PNG) resource that can be displayed to the user. Any given object might have multiple such visual representations -- multiple screenshots, for instance, or the same image at different resolutions. In Activity Streams 2.0, there are essentially three ways of describing such references. To reference a single image without any additional metadata, a direct association can be expressed as a JSON string containing an absolute IRI. Formally, the former example establishes an unqualified direct relationship with the image resource while the latter creates a qualified, indirect relationship that allows additional properties about the relationship to be specified. Individual items contained in such an array are independent of one another and no significance is given to the ordering. RFC 5988 defines that all Links have a "link relation" that describes the contextual purpose of the link. Within a Link, the rel property provides the link relation value. If no rel property is specified, the link relation is considered to be unspecified. Any given Link can have multiple link relation values. In the JSON serialization, a single link relation is expressed as a single JSON string. Multiple link relations are expressed as an array of JSON strings. The scope of the link relation is the object in which the Link is an immediate child. In the following example, two separate references are provided. The link relation of the first is unspecified, while the link relation of the second is "thumbnail". It ought to be noted that the [[!HTML5]] specification provides its own alternative definition of a "link relation" that differs slightly from the [[RFC5988]] definition. In the HTML5 definition, any string that does not contain the "space" U+0020, "tab" (U+0009), "LF" (U+000A), "FF" (U+000C), "CR" (U+000D) or "," (U+002C) characters can be used as a valid link relation. To promote interoperability, Activity Streams 2.0 implementations MUST only use link relations that are syntactically valid in terms of both the [[RFC5988]] and [[HTML5]] definitions. Implementations MAY use link relation values that are not registered. Note that the Link and Object types are disjoint from one another. That is, any given Object cannot also be a Link. Actor objects are specializations of the base Object type that represent entities capable of carrying out an Activity. The Activity Vocabulary provides the normative definition of five specific types of Actors: Application | Group | Organization | Person | Service. This specification intentionally defines Actors in only the most generalized way, stopping short of defining semantically specific properties for each. All Actor objects are specializations of Object and inherit all of the core properties common to all Objects. External vocabularies can be used to express additional detail not covered by the Activity Vocabulary. VCard [[vcard-rdf]] SHOULD be used to provide additional metadata for Person, Group, and Organization instances. "content": "This is a simple note"
While implementations are free to introduce new types of Actors beyond those defined by the Activity Vocabulary, interoperability issues can arise when applications rely too much on extension types that are not recognized by other implementations. Care should be taken to not unduly overlap with or duplicate the existing Actor types. When an implementation uses an extension type that overlaps with a core vocabulary type, the implementation MUST also specify the core vocabulary type. For instance, some vocabularies (e.g. VCard) define their own types for describing people. An implementation that wishes, for example, to use a vcard:Individual as an Actor MUST also identify that Actor as a Person as illustrated in the previous example. Activity objects are specializations of the base Object type that provide information about actions that have either already occurred, are in the process of occurring, or may occur in the future. The type property is used to identify the type of action the Activity Statement represents. The Activity Vocabulary defines a small number of Activity types that are common to many social Web applications. This specification stops short of defining semantically specific properties for most of these activities. External vocabularies can be used to express additional detail not covered by the Activity Vocabulary. While implementations are free to introduce new types of Activites beyond those defined by the Activity Vocabulary, interoperability issues can arise when applications rely too much on extension types that are not recognized by other implementations. Care should be taken to not unduly overlap with or duplicate the existing Activity types. Implementations are free to use Activity objects in both passive and imperative operations. In the passive sense, the Activity is used to record that an activity has or is occurring. In the imperative sense, the Activity can be used as a form of command, instructing an application to modify state in some manner consistent with the action being described. However, because this specification does not define a normative processing model that constrains how applications make use of the format, the distinction about whether an Activity statement is to be interpreted as a passive notification or as an imperative command can vary across implementations. IntransitiveActivity objects are specializations of the Activity type that represent intransitive actions. IntransitiveActivity objects do not have an object property. Collection objects are a specialization of the base Object that serve as a container for other Objects or Links. The items within a Collection can be ordered or unordered. The OrderedCollection type MAY be used to identify a Collection whose items are always ordered. In the JSON serialization, the unordered items of a Collection are represented using the items property while ordered items are represented using the orderedItems property. A Collection can contain a large number of items. Often, it becomes impractical for an implementation to serialize every item contained by a Collection using the items (or orderedItems) property alone. In such cases, the items within a Collection can be divided into distinct subsets or "pages". A page is identified using the CollectionPage type. The partOf property identifies the Collection to which the items contained by the CollectionPage belong. The first, next, prev, last, and current properties are used to reference other CollectionPage instances that contain additional subsets of items from the parent collection. As with Collection objects, the items within a CollectionPage might be ordered or unordered. The OrderedCollectionPage type MAY be used to identify a page whose items are strictly ordered. The OrderedCollectionPage type extends from both CollectionPage and OrderedCollection. In addition to the properties inherited from each of those, the OrderedCollectionPage may contain an additional startIndex property whose value indicates the relative index position of the first item contained by the page within the OrderedCollection to which the page belongs. Whether ordered or not, the pages of a Collection are typically arranged in a sequence (either a singly or doubly-linked list). The first property is used to identify the first page in this sequence, while the last property is used to identify the final page in the sequence. The prev and next properties identify the pages immediately before and immediately following, respectively. The current property identifies a page containing the subset of items in the Collection that have been created or updated most recently. The values for the first, last, next, prev, and current properties can be either a single CollectionPage or a Link referencing a separate resource containing a CollectionPage. 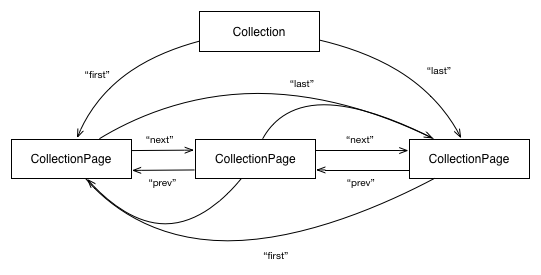 Using paging with an OrderedCollection can be tricky because there are no guarantees that implementations will process the sequence of pages in any predictable order. Implementations that wish to reconstruct the appropriate complete ordering of member items in the logical collection should navigate to the first (or last) page in the sequence then recursively follow the next (or prev) link until all pages have been processed. The pages of an OrderedCollection SHOULD be instances of OrderedCollectionPage. If the pages of an OrderedCollection are not instances of OrderedCollectionPage, a consumer will have no reliable means of reconstructing the appropriate ordering of items. Several properties defined by the Vocabulary are defined as having natural language values. These are human-readable strings using one or more languages. Within the JSON serialization, they are expressed as either (1) a single JSON string or (2) a JSON object mapping well-formed [[!BCP47]] Language-Tags to localized, equivalent translations of the same string value. In the serialized JSON, these two forms are differentiated using a simple property naming convention, for instance: "name" identifies the JSON string form for the name property while "nameMap" represents the object form. "name": "This is the title"
"es": "Este es el título"
Every key in the object form MUST be a well-formed [[!BCP47]] Language-Tag. The associated values MUST be strings. The Activity Vocabulary defines three properties that use natural language values: name, summary, and content. Accordingly, in the JSON serialization, the terms "name", "summary", and "content" represent the JSON string forms; and the terms "nameMap", "summaryMap", and "contentMap" for represent the object forms. The special language tag "und" can be used within the object form to explicitly identify a value whose language is unknown or undetermined. "und": "This is the title"
When using [[JSON-LD]] mechanisms to produce or consume Activity Streams 2.0 documents, the @language property MAY be used within a @context to identify the default language. This mechanism may not be understood by implementations that do not choose to process Activity Streams 2.0 documents using JSON-LD. Natural language values within an Activity Streams 2.0 document MAY contain bidirectional text. The default base direction of an Activity Streams 2.0 document is Left-to-Right. The base direction of individual natural language values MAY be modified as described below. When specifying bidirectional text for a natural language value, and the base direction of the text cannot be correctly identified by the first strong directional character of that text, publishers SHOULD explicitly identify the default direction either by prefixing the value with an appropriate Unicode bidirectional control character, or by using HTML directional markup where permitted. Consumers of Activity Streams 2.0 documents that contain bidirectional text SHOULD identify the base direction of any given natural language value by either scanning the text for the first strong directional character not contained within a markup tag; or by utilizing directional markup where provided. Once the base direction has been identified, consumers MUST determine the appropriate rendering and display of natural language values, according to the Unicode Bidirectional Algorithm [[!BIDI]]. This may necessitate wrapping additional control characters or markup around the string prior to display, in order to apply the base direction. Not all examples in this specification explicitly mark the language of natural language properties. This is intentional. The authors and the working group wished to avoid having implementers cut-and-paste examples from the document with explicit language markup as a template for new documents, which would consequently have inaccurate language markup. In Activity Streams 2.0, an "extension" is any property, activity, actor or object type not defined by the Activity Vocabulary. Consuming implementations that encounter unfamiliar extensions MUST NOT stop processing or signal an error and MUST continue processing the items as if those properties were not present. Note that support for extensions can vary across implementations and no normative processing model for extensions is defined. Accordingly, implementations that rely too heavily on the use of extensions may experience reduced interoperability with other implementations. For extensions, [[JSON-LD]] is used as the primary mechanism for defining and disambiguating extensions. Implementations that wish to fully support extensions SHOULD use [[JSON-LD]] mechanisms. Some popular extensions are included in the Activity Streams 2.0 namespace document, and can be reviewed at https://www.w3.org/ns/activitystreams#extensions. The Social Web Incubator Community Group maintains a wiki page on Activity Streams extensions. It is important to note that the JSON-LD Processing Algorithms [[JSON-LD-API]], as currently defined, will silently ignore any property not defined in a JSON-LD @context. Implementations that publish Activity Streams 2.0 documents containing extension properties SHOULD provide a @context definition for all extensions. "gsp:asWKT": "Polygon((100.0, 0.0, 101.0, 0.0, 101.0, 1.0, 100.0, 1.0, 100.0, 0.0))"
In JSON-LD, Compact URI expansion of values applies to properties explicitly defined as "type": "id" in the @context definition. Specifically, Compact URIs can be used anywhere an IRI (or URI) value is expected. Activity Streams 2.0 implementations that wish to fully support extensions MUST support Compact URI expansion as defined by the JSON-LD specification. Such expansion applies to all property names as well as all property values explicitly defined as type @id in the JSON-LD @context. Over reliance on the Compact URI form can lead to ambiguity and interoperability issues between implementations. Therefore, Compact URI use SHOULD be avoided in all cases other than property names and the value(s) of the type property. Implementations that use JSON-LD mechanisms to parse and then reserialize Activity Streams 2.0 documents that contain extension properties SHOULD take sufficient care to ensure that extension properties used within the original document are preserved and serialized appropriately. For instance, consider the following simple Activity Stream object containing hypothetical foo and bar extension properties. The foo extension is defined within the JSON-LD @context while the bar extension property is not. An implementation that receives this Note object can choose to parse the object as an ordinary JSON object or it can use the standard JSON-LD Expansion algorithm. If the implementation chooses to parse the object as ordinary JSON and then reserializes the object (e.g. for storage or redistribution), then it would simply preserve the values of the @context, foo and bar properties as they are and include those in the reserialized output. While this is close to the original, the use of fully expanded URI label for the foo property is not ideal. To ensure that the reserialized object is serialized correctly, implementations that perform JSON-LD expansion of received documents SHOULD preserve the original @context used when performing the JSON-LD expansion, then reuse that when reserializing the object into the JSON-LD compacted form. Activity Streams 2.0 documents can (and likely will) contain potentially sensitive personal information such as identity, contact information, physical location, physical characteristics, and so forth. Furthermore, Activity data, in general, can be analyzed to generate profiles of the behavior of individual or groups of Actors. Implementations that produce or consume Activity Streams 2.0 documents MUST take steps to openly and publicly document and communicate to all potential users: (a) the kinds of potentially sensitive personal information published, consumed or collected by the implementation, (b) the reasons for publishing, consuming and collecting that information, (c) the manner in which that information is being used, (d) the identity of any other party with whom that information is being shared, and (e) the reason the information is being shared with other parties. Implementations that publish Activity Streams 2.0 documents SHOULD assume a default position of limiting both the kind and amount of sensitive personal information included in the document unless users have "opted in" to sharing additional detail. Implementations that consume Activity Streams 2.0 documents SHOULD NOT, by default, store or share sensitive personal information included within consumed documents unless users have "opted in" to allowing that information to be stored or shared. In this context, "opting in" does not necessarily require explicit action on the part of the user. If, for instance, the use of certain sensitive personal information is clearly implicit in the use of an implementation (a location tracking service, for example), then any use of that implementation can be considered an implicit acknowledgement that the sensitive personal information will be used and shared so long as the documentation guidelines listed above are followed. Publishers or Consumers implementing Activity Streams as a stream of public data may also want to consider the potential for unsolicited commercial or malicious content and should take preventative measures to recognize such content and either identify it or not include it in their implementations. Publishers should take reasonable measures to ensure potentially malicious user input such as cross-site scripting attacks are not included in the Activity Streams data they publish. Consumers that re-emit ingested content for crawling by search engines should take reasonable measures to limit any use of their site as a Search Engine Optimization loophole. This may include converting untrusted hyperlinks to text or including a rel="nofollow" attribute. Activity Streams are JSON Documents and are subject to the same security considerations described in [[!RFC7159]]. Activity Streams implementations handle URIs. See Section 7 of [[!RFC3986]]. Activity Streams implementations handle IRIs. See Section 8 of [[!RFC3987]]. This specification registers the application/activity+json MIME Media Type specifically for identifying documents conforming to the Activity Streams 2.0 format. Optional parameters: profile: The profile parameter for the application/activity+json media type allows one or more profile URIs to be specified. These profile URIs have the identifier semantics defined in [[!RFC6906]]. The "profile" media type parameter MUST be quoted. It contains a non-empty list of space-separated URIs (the profile URIs). The "URI" in the above grammar refers to the "URI" as defined in Section 3 of [[!RFC3986]]. Encoding considerations: Resources that use the "application/activity+json" Media Type are required to conform to all of the requirements for the "application/json" Media Type and are therefore subject to the same encoding considerations specified in Section 11 of [[!RFC7159]]. Note that while the Activity Streams 2.0 format uses JSON-LD conventions, there are a number of constraints and additional requirements for Activity Streams 2.0 implementations that justify the use of a specific media type. Because Activity Streams 2.0 can be considered a restricted profile of JSON-LD, Implementations SHOULD consider the `application/ld+json; profile="https://www.w3.org/ns/activitystreams"` media type as being equivalent to `application/activity+json`. Conforming documents are those that comply with all the conformance criteria for documents. For readability, some of these conformance requirements are phrased as conformance requirements on publishers; such requirements are implicitly requirements on documents: by definition, all documents are assumed to have a publisher. Conforming documents must not include deprecated or obsolete syntax from Activity Streams 1.0. Conforming documents must include properties and types from the Activity Vocabulary. Conforming documents that use other vocabularies must also include equivalent Activity Vocabulary properties and types as illustrated in Section C. Conforming documents must not use features of JSON-LD or other serialization features disallowed in this specification, as in Section 2. Conforming documents that include types or properties beyond those defined in the Activity Streams 2.0 Vocabulary must use the extensibility features defined in section 5. Conforming implementations are software that publish, store, analyze, consume or otherwise process conforming documents. The two main kinds of implementations are publishers and consumers. Conforming publishers are implementations that create and publish conforming documents. Conforming publishers must make conforming documents available according to the serialization requirements of section 2. Conforming publishers must consider privacy as described in section 6. Conforming publishers must consider security as described in section 7. Conforming consumers are implementations that read and analyze conforming documents. Conforming consumers must tolerate deprecated or obsolete properties or types from Activity Streams 1.0. Conforming consumers must ignore properties or types that are not applicable to their application domain. Conforming consumers may re-publish conforming documents in other other data formats. Conforming consumers may present conforming documents to a user on screen, in print, in audio format, or using other presentation mechanisms. Conforming consumers must faithfully translate the information represented in conforming documents into these other formats or media. Conforming consumers that re-publish conforming documents must consider privacy as described in section 6 and security as described in section 7. The Activity Streams 2.0 specification is a product of the W3C Social Web Working Group. The editors thank all of the Working Group members who contributed to the conversations, issues and testing that helped shape the current specification. The editor's also wish to thank all of those who contributed to Activity Streams prior to the specification being picked up as a contribution to the W3C Social Web Working Group. Activity Streams 1.0 was a community driven effort and the specification would not be where it is today without the earlier contributions from the community, including, but not limited to: Abdul Qabiz, Adina Levin, Adrian Chan, Adriana Javier, Alan Hoffman, Alex Kessinger, Alexander Ovchinnikov, Alexander Zhuravlev, Alexandre Loureiro Solleiro, Amy Walgenbach, Andres Vidal, Angel Robert Marquez, Ari Steinberg, Arjan Scherpenisse, Arne Roomann-Kurrik, Beau Lebens, Ben Hedrington, Ben Metcalfe, Ben Werdmuller, Benjamin Goering, Bill de hOra, Bo Xing, Bob Aman, Bob Wyman, Brett Slatkin, Brian Walsh, Brynn Evans, Charlie Cauthen, Chris Chabot, Chris Messina, Chris Toomey, Christian Crumlish, Dan Brickley, Dan Scott, Daniel Chapman, Danny Ayers, Dare Obasanjo, Darren Bounds, David Cramer, David Nelson, David Recordon, DeWitt Clinton, Douglas Pearce, Ed Summers, Elias Bizannes, Elisabeth Norris, Eric Marcoullier, Eric Woods, Evan Prodromou, Gee-Hsien Chuang, Greg Biggers, Gregory Foster, Henry Saputra, Hillary Madsen, Howard Liptzin, Hung Tran, Ian Kennedy, Ian Mulvany, Ivan Pulleyn, Jacob Kim, James Falkner, James Pike, James Walker, Jason Kahn, Jason Kantz, Jeff Kunins, Jeff Martin, Jian Lin, Johannes Ernst, John Panzer, Jon Lebkowsky, Jon Paul Davies, Jonathan Coffman, Jonathan Dugan, Joseph Boyle, Joseph Holsten, Joseph Smarr, Josh Brewer, Jud Valeski, Julien Chaumond, Julien Genestoux, Jyri Engestroem, Kaliya Hamlin, Kevin Marks, Laurent Eschenauer, Laurie Voss, Leah Culver, Libby Miller, Manu Mukerji, Mark Weitzel, Marko Degenkolb, Marshall Kirkpatrick, Martin Atkins, Martin Svensson, Marty Alchin, Mary Hoder, Matt Leventi, Matt Wilkinson, Matthias Mueller-Prove, Max Engel, Max Wegmueller, Melvin Carvalho, Michael Buckbee, Michael Chan, Michael Richardson, Michael Sullivan, Mike Macgirvin, Mislav Marohnić, Mo Jangda, Monica Wilkinson, Nate Benes, NeilFred Picciotto, Nick Howard, Nick Lothian, Nissan Dookeran, Nitya Narasimhan, Pablo Martin, Padraic Brady, Pat Cappelaere, Patrick Aljord, Peter Ferne, Peter Reiser, Peter Saint-Andre, Phil Wolff, Philip (flip) Kromer, Richard Cunningham, Richard Zhao, Rick Severson, Robert Hall, Robert Langbert, Robert Dolin, Robin Cover, Ryan Boyd, Sam Sethi, Scott Raymond, Scott Seely, Simon Grant, Simon Wistow, Stephen Garcia, Stephen Sisk, Stephen Paul Weber, Steve Ivy, Steve Midgley, Steven Livingstone-Perez, Sylvain Carle, Sylvain Hellegouarch, Tantek Çelik, Tatu Saloranta, Tim Moore, Timothy Young, Todd Barnard, Tosh Meston, Tyler Gillies, Will Norris, Zach Copley, Laurent-Walter Goix, Matthew Marum, Andy Smith, and Zach Shepherd. Note: While this appendix sections is non-normative, it uses normative terms such as MUST. Where used, the meaning is to indicate what would be required to properly implement the Activity Streams 1.0 backwards compatibility model described in this appendix if an implementer chose to do so. While the syntax defined by this specification diverges from that defined by JSON Activity Streams 1.0, the fundamental model defined by that original specification remains intact. Specific processing rules are defined by this specification that allow existing Activity Streams 1.0 documents to be mapped to and processed as an Activity Streams 2.0 document. The JSON syntax defined by this specification differs somewhat from that defined in the original JSON Activity Streams 1.0 [[AS1]] specification in ways that are not backwards compatible. Implementations can choose to continue supporting the JSON Activity Streams 1.0 syntax but ought consider it to be deprecated. This means that while implementations can continue to consume the 1.0 syntax, they should not output the 1.0 syntax unless specifically interacting with older non-2.0 compliant implementations. Implementations can use the "application/stream+json" MIME media type when producing a JSON serialization using the Activity Streams 1.0 syntax, and "application/activity+json" when producing a serialization conforming to the 2.0 syntax. Implementations that process serializations identified using either the "application/stream+json" or the more generic "application/json" MIME media type MUST follow the syntax and processing rules set by [[AS1]]. The 2.0 syntax and processing rules apply only when handling serializations using the "application/activity+json" media type. When processing Activity Streams 1.0 documents using a JSON-LD processing model, implementations can use the special AS 1.0 to AS 2.0 expansion @context definition provided here to produce the JSON-LD expanded representation. Refer to the JSON-LD Processing Algorithms and API for details. When processing Activity Streams 1.0 documents and converting those to 2.0, implementations ought to treat id as an alias for the JSON-LD @id key word; and the objectType and verb properties as aliases for the JSON-LD @type keyword. Activity Streams 1.0 uses the displayName property which has been renamed to name in Activity Streams 2.0. Implementations ought to treat displayName as an alias for name. Activity Streams 1.0 uses the title property which has been dropped from Activity Streams 2.0. Implementations processing Activity Streams 1.0 documents as Activity Streams 2.0 ought to treat instances of the title property as an extension. This document redefines the content and summary properties as natural language values which means their values can be expressed as either a string or an object mapping language tags to string values. In the 1.0 syntax, these are expressed solely as String values. Because the 1.0 values are a valid subset allowed by this specification, implementations are not required to take any specific action to continue supporting those values. This document redefines a large number of common properties defined originally as Objects in 1.0 as either Objects or Links. The JSON-LD serialization allows such property values to be expressed as either an IRI String, an JSON object, or an Array of IRI Strings and JSON objects. Because the 1.0 values are a valid subset allowed by this specification, existing implementations are not required to take any specific action to continue supporting those values. This specification deprecates the upstreamDuplicates and downstreamDuplicates properties defined by Activity Streams 1.0 and does not provide a replacement. This is due largely to lack of any reasonable implementation evidence. While the upstreamDuplicates and downstreamDuplicates properties MAY continue to be used, implementations SHOULD avoid them. In Activity Streams 1.0, the "post" verb was defined to describe the action of both creating an object and "posting" or uploading it to a service. This specification replaces the "post" verb with separate Create and Add Activity types. When processing Activity Streams 1.0 documents and converting those into 2.0, implementations SHOULD treat instances of the "post" verb as equivalent to Create if there is no target property specified; and equivalent to Add if there is a target property specified. By following these guidelines, all JSON Activity Streams 1.0 serializations can be processed successfully by 2.0 implementations. It is possible use multiple vocabularies to cover particular characteristics of the activities like data provenance and annotations, which can compliment the Activity Vocabulary. For example: Eric writes a short note to be shared with his followers. After posting the note, he notices a spelling error. He edits the note and re-posts it. Later, Eric decides that the information in the note is incorrect. He deletes the note. A series of activities; creating, editing, and deleting a note. "content": "Remember... all I'm offering is the trooth. Nothing more." The following notable changes have been made to this document since the previous candidate recommendation of 2016-12-15. Removed process sections, especially those noting exit criteria and at-risk features. Updated Collection Paging to clarify additional CollectionPage properties. Used better wording for summary as text representation. Updated context examples to include more realistic complex contexts.